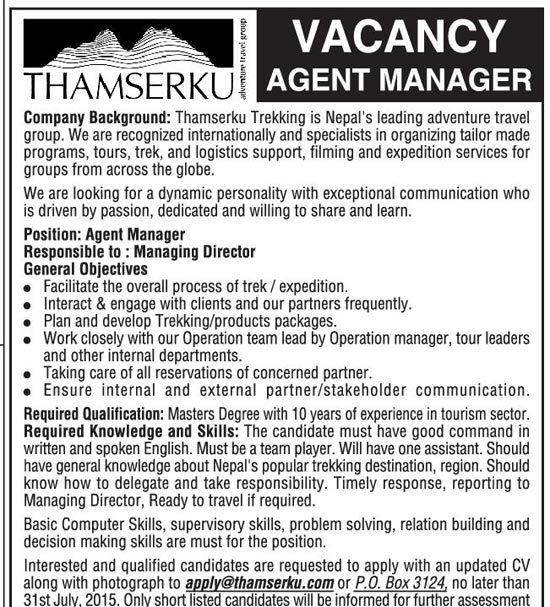 Thamserku Trekking is Nepal's leading adventure travel group. We are recognized internationally and specialists in organizing tailor made programs, tours, trek, and logistics support, filming and expedition services for groups from across the globe. We are looking for a dynamic personality with exceptional communication who is driven by passion, dedicated and willing to share and learn. Required Qualification: Masters Degree with 10 years of experience in tourism sector. Required Knowledge and Skills: The candidate must have good command in written and spoken English. Must be a team player. Will have one assistant. Should have general knowledge about Nepal's popular trekking destination, region. Should know how to delegate and take responsibility. Timely response, reporting to Managing Director, Ready to travel if required.